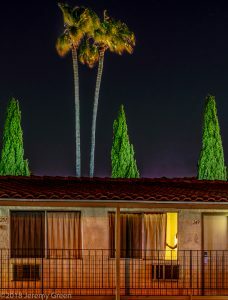 The trees at the motel in San Jose were foreign to my sensibilities, as was the coolness of the night air. Flying into California from central Texas last June on assignment, I was pleased to be away from the intense heat of home and spent some time gathering impressions with a camera mounted on a tripod. Even though I was still on central time and pretty tired, the graphic landscape and chilly air was stimulating. This image was made with some effort, shot from the swimming pool area which was locked up for the night. 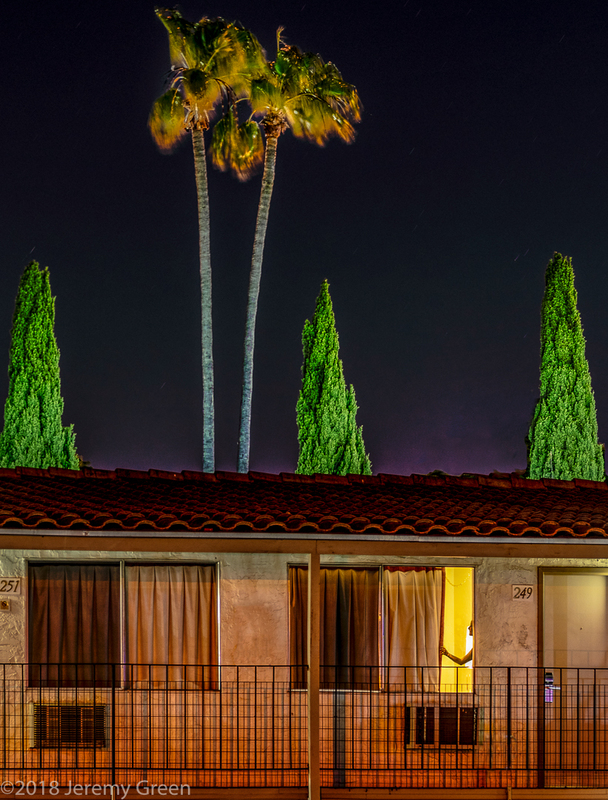 I got a motel employee to unlock the gate and let me in. The person in the window was not there. She was back home on a hard drive. I loved this even before I noticed the person in the window. So you photoshopped her in? Over the top! Thank you Jennifer. I think the woman needed to be there to play off the previous image by Martin, however I composed this image several weeks ago and was waiting for a use for it.